With back to school right around the corner get that teacher or little one the perfect gift to show them just how special they are. GourmetGiftBaskets.com makes that easy! They have a huge selection of gifts perfect for all ages. Their Care Packages come in a variety of different occasions and are perfect for many different people and events including back to school. Check out the student care packages here and college care packages here. The Send A Bear Hug Care Package is my personal favorite. Teddy Bear - Assorted Colors - A beautifully crafted teddy bear made from soft, plush fabric and adorned with a silky bow. Cinnamon & Brown Sugar Kettle Corn by KingOfPOP.com - 4.2 oz. -Handcrafted popcorn that’s been popped in a mixture of healthy oil, refined sugar, and gourmet salt. Then its evenly dusted with sweet brown sugar and freshly ground cinnamon. Butter Toffee Peanuts by Hammonds - 5 oz. - Hand roasted peanuts are coated in buttery, sugary toffee, for a crunchy and delicious treat! Chocolate Chip Cookies by Kimball Lake Bakery - 4 oz. - Mini milk chocolate chip cookies that are the perfect bite. Sweet Onion Kettle Corn by KingOfPOP.com - 1.8 oz. - Just the right amount of sweetness mixes with our own proprietary blend of onion seasoning for a truly unique popcorn flavor! Strawberry Twizzlers by Hershey - 7 oz. - Chewy fruit twists that explode with the delicious taste of sweet, ripe strawberries. Chocolate Wafer Rolls by Dolcetto - 4.4 oz. - Delicate European-style wafers that are rolled into cylinders and filled with creamy chocolate. Wild Berry Skittles by Wrigley - 2.17 oz. - The classic rainbow candy everyone loves, in an assortment of delicious berry flavors! Cheez-its by Sunshine - 3 oz. - Crisp square crackers that are just bursting with the sharp, salty taste of cheddar cheese. Strawberry Airhead by Van Melle - .55 oz. - A delicious mouthful of chewy taffy candy that bursts with the vibrant taste of sweet strawberries. (2) Atomic Fireballs - These individually wrapped hard candies are on fire, exploding with a blasting, bold cinnamon-y taste. (2) Jawbreakers - As their name implies, these individually wrapped candies are hard as a rock but burst with sweet fruity flavors that change over time. (2) Tootsie Roll Midgees - Those perfect bite-sized chocolate treats that you can't get enough of! (2) Laffy Taffy - With a joke in every wrapper, these long-lasting taffy squares of sweet fruit flavors are certainly fun. (2) Smarties - Vibrant sugar coated candies in eight deliciously fruity flavors. 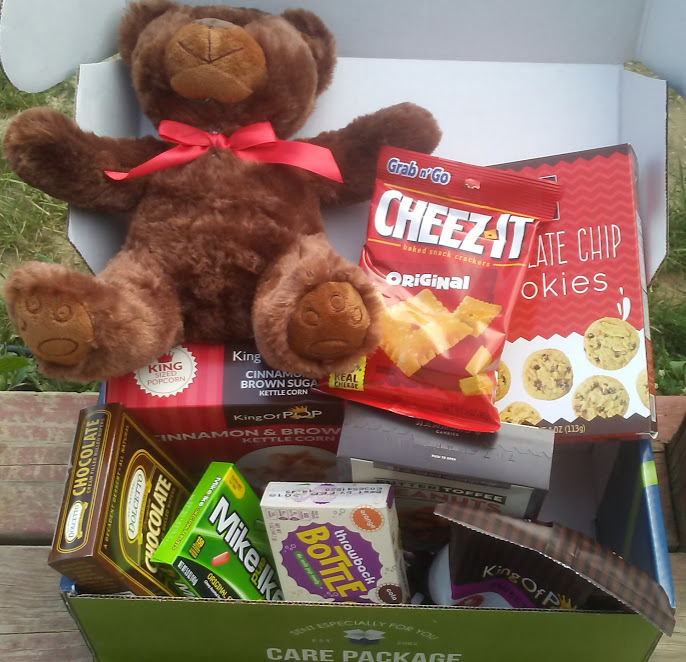 We loved every item in the Send A Bear Hug Care Package! There honestly wasn't one thing we didn't enjoy including the bear! Our favorite items were the bear of course it was adorable and the chocolate wafer rolls.. The selection and variety of candies and treats is great for all ages. My sons loved the candy and they are 7 and 8. I loved the bear I think it is great as a reminder to not be scared about back to school. Or even for a teacher the bear would be lovely to receive as a memento to remind them of their students. I like the Junk Food Care Package. My favorite would be the Classic Red Wine Gift Basket. I love the Snack & Chocolate Executive Suite Signature Series. I love the junk food care package. My son would love to receive it as a treat or as his Easter basket. I like the junk food care package! I like the Favorite Treats basket. The BBQ Boss would be excellent. I like the Sweets & Treats Gift Basket. My favorite basket is the Love & Romance Gift Baskets.